You are here: Home / Blog Post / Ready to see bidders “freak out?” Here’s how … don’t include Extended Bidding in your mobile bidding silent auction. Yesterday I explained the difference between Max Bid and Extended Bidding. I don’t want to tell you what to do, but if you don’t understand the difference between the two features (and most people won’t…), you should read that post FIRST. Max Bidding doesn’t work that well because most people aren’t honest with themselves when it comes to putting in our “real” top bid. We put in a number that we “hope” to buy the item for. We don’t put in what we are REALLY willing to pay, should our feet be put to the fire. Friends, that’s called Auction Fever. Auctions are filled with psychology. When it comes down to it, bidders will bid more than they planned for items they really want … or when their ego gets the better of them. Some items in your auction will draw last minute bids. Maybe a fabulous vacation … or a choice bottle of wine. If you could extend the bidding on those items, you’ll raise $100s to $1000s more. Consider this TRUE story from a school auction. Bidder #25 put in a max bid of $2000 on a basketball suite. Meanwhile, Bidder #43 put in a max bid of $2100 on the same item. Extended bidding was NOT offered, so when the silent auction closed at 7:30 PM, Bidder #25 received an alert from his mobile bidding device. He was told his Max Bid was reached but he’s NOT the high bidder. In the final few seconds before the hammer falls (to use a customary auction term), some bidders are always willing to bid “one more time.” Some are willing to increase the bid in their attempts to buy the item. In other words, the bidder paid MORE than his planned Maximum Bid! Why do bidders bid over their planned budget? Because reason flies out the window in the heat of the moment. If I were to offer Max Bid options in a live auction, it would SUPPRESS BIDDING. It would force each bidder to stick to his intended budget. Spontaneous bidding – for which benefit (and commercial) auctions are known– would HALT as the bidder would be forced to sit on his hands when his Max Bid was reached. But you want bidders to enthusiastically pay MORE than they intended! What they are willing to pay while sitting at home thinking about your items is usually much less than what they are willing to pay in the heat of bidding. At 7:30 PM when the auction was scheduled to close, Bidder #25 receives an alert. He’s told that his Max Bid has been reached and he’s NOT the high bidder. He’s told that the high bid is now $2100, and – because of Extended Bidding– he has 5 more minutes to reconsider his Max Bid. He inputs a higher bid … perhaps this time, it is his “real” Max Bid. Interesting, eh? Before bidding started, his Max Bid was $2000. Now he’s prepared to bid more. All bidders who had bid on that item now have an additional 5 minutes to bid. And if one of them bids in the final nanoseconds before the auction closes, ONCE AGAIN, an alert goes out to everyone saying, “Extended bidding is now continuing for 5 more minutes.” The extensions continue until bidding stops. REALLY stops, because no one is willing to pay more. It’s not ARBITRARILY stopping because of some silly closing time. This is auction fever in action! Auction fever isn’t just something I’ve observed. Mobile bidding vendor Handbid witnessed bidders “freaking out” when they couldn’t bid again. They then immediately set about adding Extended Bidding into their application. Handbid is one of the FEW providers offering Extended Bidding functionality. They noticed bad bidder behavior when one would lose on a Max Bid. We saw numerous people at the end of the auction “freak out” when their proxy bid was trumped and scrambled to place a last minute bid on an item to win it. In conclusion, although Max Bid is a nice tool, it doesn’t replace Extended Bidding. These are different features for different problems. If you’re selecting a tool and want your bidders to be happy, make sure your tool includes Max Bid. If you’re selecting a tool and want your nonprofit to be happy, find a tool that offers Extended Bidding. 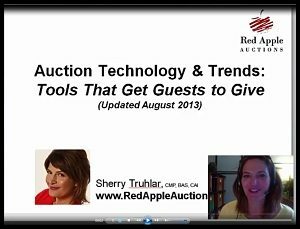 Are you beginning to sense how much there is to know when it comes to auction technology? Here are two ideas to save your sanity. Second, if you want more personalized help deciding which is the best vendor for your auction, schedule a consultation with me. I’ve helped many nonprofits figure out their technology needs .. and not just for mobile bidding! Software … payment services … registration needs …etc. We, at bidcoz.com (formerly School Auction Manager), have been offering this feature since we launched. We call it “anti-sniping” and we saw the need for the very reasons you mentioned above. The way we do it is, in the last 5 minutes of an auction, if someone places a bid, 15 minutes is added to the end time to allow other bidders to come back in and bid again. This can go on until bidders stop bidding or until the auction chooses a final closing time. We don’t want to leave any money on the table during a silent auction! Another great advantage of mobile bidding. That’s great, Donna! There are always a few items that are hot property in the silent auction, and that’s an excellent way to maximize their price. When using this feature, a nonprofit is better controlling its guests. Bidders aren’t trained to delay bidding; the silent auction remains an auction instead of a “closest bidder to closing time wins” activity.